If you're looking for budget-conscious, efficient basic transportation you'll like the 2010 Chevrolet Aveo. Practical, utilitarian and with no complicated high-tech systems to learn, the little sedan is also a good choice for RVers looking for a haul-behind car. Another plus: The high seating position for driver and passenger. Economical and reliable (less 1 hiccup). 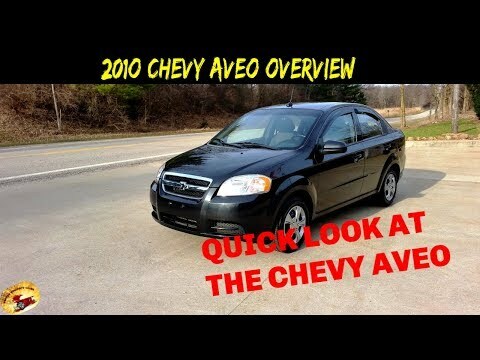 The 2010 Chevy Aveo has been very reliable, except for 1 issue we had. The first year after getting it the power would cut out randomly for no reason. Mechanics could not diagnose the problem. This happened 2-3 times, but soon corrected itself and never happened again. It has been rock solid ever since. The gas mileage is great and it's cheap to upkeep. It is a tad too small though for interior and storage room. The most adorable little Chevy Aveo. I love my little car. It is got character and it is extremely easy to drive. I am not a huge fan of it just being white simply because I prefer something that stands out more. And the ac quit working on me which is not the best down here in n. C. In the summer. But my car feels like a second skin with how easy it is to drive. I plan on keeping it around for quite a while. It is compact, the perfect color and great to drive. I love the size. Small and fits in almost any parking space. I like that it is a standard shift. Makes for easier driving in the snow. The hatchback makes it easier for packing in groceries or luggage for traveling. The only downfall is the windows are manual and not automatic. Perfect car for me or someone with a small family.